The Camino Ingles is an authentic pilgrimage route for English and Northern European pilgrims in the middle ages, who came by sea from their homelands to La Coruña or Ferrol, and then walked to Santiago. Santiago de Compostela is roughly 60 km from La Coruña, and 120 km from Ferrol. To gain the compostela, you must walk at least 100 km, hence the modern-day preference for Ferrol as the starting point, though there is a campaign asking Cathedral authorities to allow pilgrims starting from La Coruña to gain the compostela. So why were we doing the Camino? The Camino is a pilgrimage, a route that has been around for over a thousand years. Anyone who has done the Camino gets a lot of credibility that can be applied to any goal in your life. This is just the first step. I had no intentions of writing a book – I wanted to walk in 2016 to achieve a health goal and to prove to myself that I could do this! 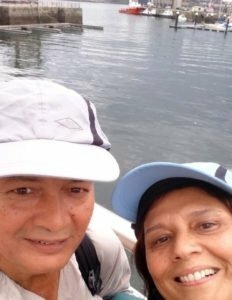 This is hubby and me starting out from the docks at Ferrol, with the port behind us and the first marker of the Camino Ingles in front of us. After weeks of training, and a long journey from Australia we are finally here and ready to walk. Boots on, hats on, rain gear handy, and water bottles filled, but where do we get the credencial? The tourist office had run out of them, was there a mob of pilgrims ahead of us? So we got the credencial from the exquisite little Cathedral, just before the office closed for siesta. It’s always good for a bit of sheer magnificence before a 15 km trek .. and yes, we did get lost on the first day. That’s why I created maps for the cities! Download my sketch maps.